As the New York Post continues its increasingly tedious assault on pedestrians and crosstown transit riders, its writers always seem to suggest that giving priority to buses in an important retail area is both radical and self-evidently bad for business. If they bothered to look just one borough away, they’d see that nothing could be further from the truth. The eight bus- and pedestrian-only blocks of downtown Brooklyn’s Fulton Mall make up the most successful retail strip in the city outside of Manhattan. It was a similar bus- and pedestrian-only plaza that the DOT scrapped for a single block of 34th Street, between Fifth and Sixth Avenues — partially, it seems, at the behest of Macy’s and local real estate interests. So it’s revealing to compare the current clamor over the 34th Street plaza, the 34th Street transitway, and now, in the Post at least, any transit improvements whatsoever, to the creation of the Fulton Mall. Over time, however, the design morphed — in some ways unintentionally — from one intended to compete with Long Island shopping malls into one that embraced its Downtown Brooklyn location. According to a 1977 article in the New York Times, for example, plans for a Plexiglas arcade covering the street were scrapped by the time construction started. Of course, the suburban concept never disappeared entirely. According to TenHoor, the department stores also built a series of large parking garages behind Fulton Street in order to try and attract shoppers heading out to suburban malls. Politically, the Fulton Mall was relatively uncontroversial. While a Lindsay Administration plan to pedestrianize Madison Avenue was defeated by the Board of Estimate (at the hands of future mayor and then-comptroller Abe Beame), Brooklyn Borough President Sebastian Leone and the taxi industry, both Beame and Leone supported the Fulton Street project. Integral to winning business support, said TenHoor, was ensuring that deliveries could be made. “That was the first thing that the planners of the street did to get businesses on board.” In many cases, they developed delivery routes on the side streets, she said, though delivery vehicles are currently allowed on Fulton Street between 7 p.m. and 7 a.m.
Today, the Fulton Mall is one of the most successful retail streets in New York City. Rent for retail is more expensive than anywhere else outside of Manhattan, according to industry data. “It is a point where all of this transportation converges and people come from all over Brooklyn to shop,” said TenHoor. Any comparison between the Fulton Mall and the abandoned plans for 34th Street isn’t apples-to-apples, of course, but the concepts were fundamentally similar. Prioritizing bus riders and pedestrians along Fulton Street earned strong political support and has proven popular for shoppers and profitable for retailers. What’s so different on 34th Street? Tellingly there are those who DO NOT consider Fulton Mall to be successful. Why? Because all that money is being generated primiarily by large numbers of low- and moderate-income Afro-Americans, rather than the White yuppies who are increasingly common in the surrounding neighborhoods. Same thing on Fordham Road, where rents and sales are also sky high. I shop their, it was the only place in Brooklyn that I could get an AC Roma red and orange home jersey. 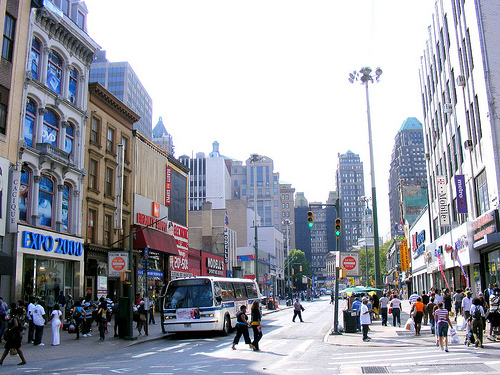 Fulton St. has the highest per square foot commercial rents in Brooklyn,a FUBU paradise. Interesting to me that it was created by a fusion of commercial interests and the old Board of Estimate political structure of empowered Borough Presidents. Out present system of neutered Borough Presidencies leaves the position a magnet for powerless, self-promoters looking for an eight year resting place in their political careers before resuming their inevitable flight path from young Turk to old Dinosaur. Does Macy’s realize that one of its department stores is IN the Fulton Street Mall? The Brooklyn manager should have a chat with the 35th Street store people! Sorry, 34th Street store. You know I meant that! There is a very interesting book on a block in Chicago that is very much like the Fulton Mall (from the perspective that Larry mentions) called “Here’s the Deal” that is worth reading for those interested in the politics of urban development. The difference is that no one lives on Fulton Mall. That, and the fact that the crosstown through traffic connecting the highways, bridges and tunnels is carried by other streets (Atlantic and Tillary). I’m not defending the detractors of the 34th Street Transitway, but Fulton is a bit different in the character of the traffic, and maybe a more palatable candidate to the driving masses. Nice piece of reporting, Noah. And Nic, I think you meant 12 years (in Brooklyn, anyway). I think Streetsman makes an excellent point. I would also add that the Downtown Brooklyn core, which surrounds Fulton Mall, did not have people living there in any significant number until very recently (400 in 2000 vs. 12,000 in 2010). Thus, changes to curb access and issues of rerouted traffic did not have to be approved by residents, as there simply were none. Fulton mall was purely done by businesses, many of whom were desperate for any solution in an era of rapid decline due to suburbanization. Now, the overall situation has dramatically changed. Instead of grasping for any solution, businesses are now worried about any changes to the status quo, as the current system appears to be working just fine and making them money. Why should they want to change things? The same goes for residents. I disagree that everything’s fine there, but the burden of proof is and should be is on the people who are making the change. I like this project, but unlike on PPW, the residents in this case have very rational, albeit completely self-interested, concerns. It certainly would be much more difficult to access the curb if there was a busway there. Many older folks cannot walk long distances and must catch cabs to go anywhere. Also, some traffic would be rerouted to neighboring streets which is understandably undesirable. Convincing all these people that change would make things better is the job of livable streets advocates and the job of the DOT. It seems that we could do a much better job in that regard. …Streetsblog continues its increasingly tedious assault on cyclists. there is nothing similar about these two streets — pre-design, post-design, or otherwise. the Fulton Street Mall, for instance, is a mall — not a motorway. it’s still dominated by gargantuan buses, ruining the potential atmosphere, but at least it doesn’t also have an additional two motorized lanes for high-speed car traffic. additionally, the Fulton Street Mall is disastrously ugly. which is why they’re going to spend $15 Million to try to make the place look decent. as far as the lack of curbside parking — just take a look at the Bing Street View — SUVs, Fedex and UPS trucks — all parked on the ‘sidewalk’ — to the extent that you can actually call it a sidewalk. and tho bikes may officially be legally banned from the Fulton Street Mall, bikes can still find a way to use it because the street is so narrow, doesn’t have speed-inducing concrete barriers to separate motorized traffic moving in opposite directions from each other, which increases ‘friction’, and causes them all to slow down a be a bit more careful. the bus bunching also allows cyclists to escape the ire of entitled and angry bus and truck drivers. the narrower street also allows pedestrians to cross the street at will, again increasing friction, and causing all street traffic to slow and keep the street somewhat sane. none of this would be true on the 34th Street Motorway. the reason people still come to Fulton Street is for many reasons, but one is because the street benefits from untold city subsidies which just concentrates commercial activity on this street instead of spreading it more evenly around Brooklyn. which is why people say they can only find certain things at the Fulton Street Mall — of course — businesses aren’t stupid — if the city government sets up a gravy train of subsidies, those corporate businesses are going to flock there. independently-owned and run stores? forget about it — this Mall, like most others like it, will always be dominated by big, commercial retailers with political connections. we don’t need to talk about the Walmart-ization of worker rights, pay, benefits, etc. that results from these subsidized malls. the answer? of course, it’s the same as it ever way — allow pedestrians, allow bikes, in that priority order. if you do this, you have a shot of creating a decent and just society. more, prioritize non-motorized transport over motorized, always, and you’ll have a shot at keeping New York City above the waterline — not an insignificant consideration. Huh? Peter, Fulton Mall has a bunch of independently-owned and run businesses. If you want to compare another street in NYC with Fulton Mall, the best contender would be 125th Street. It has an extremely similar mix of businesses, AND crosstown buses that travel slower than walking speed most of the day. I don’t get paragraph three. First you’re quoting an author about what happened in the 1960s, then there is a reference to the Downtown Brooklyn Partnership, which was formed in the 21st century. Or was there another group by the same name 50 years ago?